So many people dream of going to Paris, but not me. Oh yes - I dream of going to France - but not to Paris really, although I wouldn't mind seeing it just once, I suppose. Rather, I dream of going to Giverny and seeing where Claude Monet lived and walked. Of all the artists that ever lived, he is one of my favourites if not my very favourite. Ohhhh to see his pond and feel the sunshine on my face where he has been! I was first introduced to him through my college Art Professor, Savin (if I remember correctly) who took us all by bus down to the Chicago Institute of Fine Art. Monet's work was being featured there and I fell in love immediately-- have not stopped since. I love all the Impressionists really - what they did for art, artists and viewers by bringing bold full colour to paintings was something remarkable and incredible. It was a movement of artistic freedom never to be lost again ... and they paid the price for it too at the time with ridicule and disdain. They paved the way for all impressionism, post impressionism, cubism, and modern art. My health and immobility issues now restrict travel but my dreams will live on til the day I'm gone from this earth too. 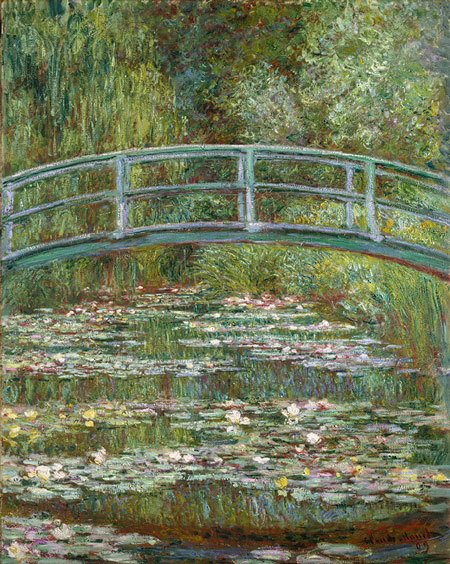 I hope Mr. Monet is there in that other world for me to sit and visit with a spell. Hello! My name is Yvonne (nickname = Von) I'm a fine art Genesis Oils painter of many years and now adventuring into painting with Oil Pastels, Water Soluble Mediums and Art Journaling. Its an exciting journey and one I hope you will enjoy with me. Via Von - all images are copyrighted. Powered by Blogger.